The medical care and treatment system for insane persons, etc. aims to improve the mental condition of those who have committed a seriously harmful acts while suffering from insanity and prevent the recurrence of such acts led by their insanity by providing consistent and appropriate medical care and observations/instruction necessary in securing medical care for them, thereby facilitating their reintegration back into society. It has been implemented in accordance with the Act on Medical Care and Treatment for Insane Persons, etc. 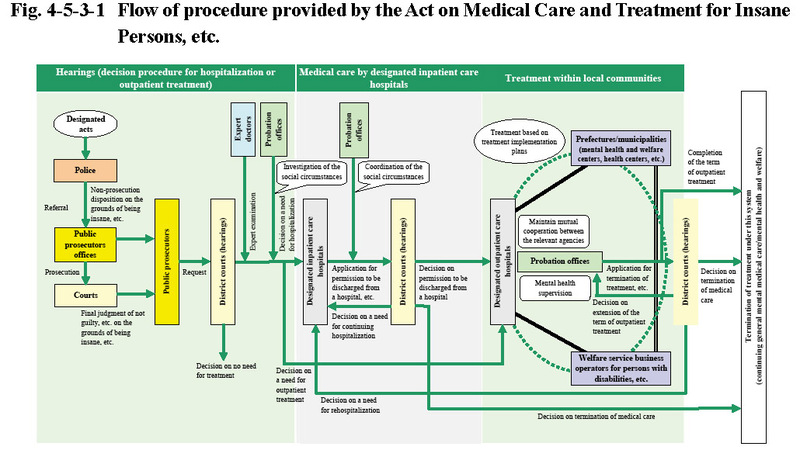 The said Act was enforced on July 15, 2005 and the flow of the procedure is as given in Fig. 4-5-3-1.